McLaren Carbon Fiber Parts & Accessories - Exotic Car Gear, Inc. This Application Required Quantity of 2 Filters. …It’s about the Strength Of the pleats. A steel wire mesh creates strength and deep pleats in the double-layered cotton frame providing a 10-15% increase in filtration surface. This increase allows a greater volume of air to move more freely into your engine while maintaining superior filtration. Our specially designed virgin cotton filter element traps particles as small as 5 microns in the harshest of conditions. Our filters are designed as a direct fit component from our extensive library of original molds. The templates are produced on a CNC machine and the rubber base of the Green Dragon Filter is molded by hand. 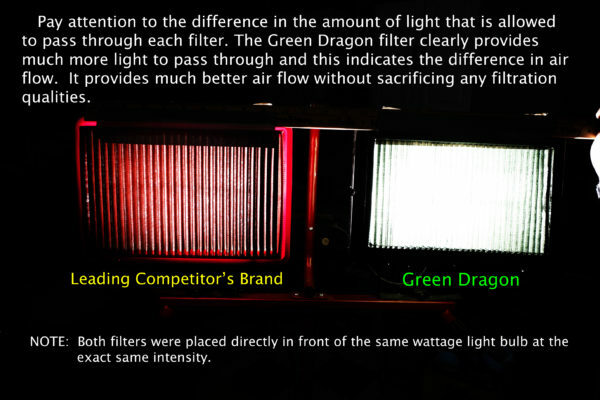 We maintain an extensive library of molds and air boxes to guarantee when you purchase a Green Dragon High performance Filter it will fit and seal just as the original filter, without modifications. 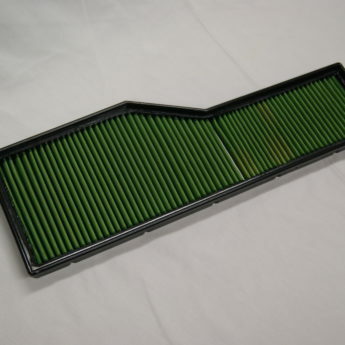 The surface area of the filter can be reduced with modern injection molding processes allowing excess rubber to bleed into the filter element area. At Green Dragon we choose to hand mold our rubber frames to control the excess material that may seep into the filter element. This excess material or “spilt rubber” can reduce the filters intended air flow up to 25%. We achieve the maximum air flow with our four step process the virtually eliminates any loss of seepage while providing maximum airflow. 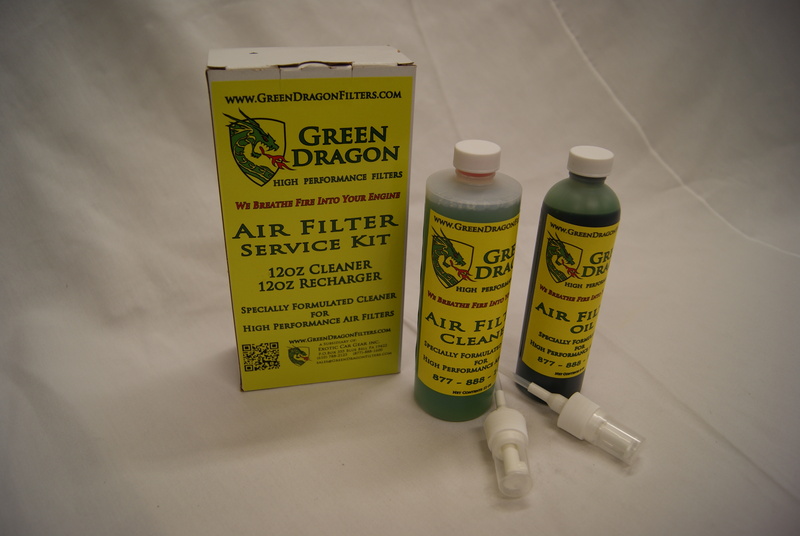 Our cleaner and recharger system is a silicone based so it will not harm or affect your Mass Air Sensors. Your air intake system is like a set of lungs, more air flow equals more power! The restrictive design of OEM filters can hold y our engine back from peak performance. Adding a Green Dragon Filter immediately opens up the airways for your engine to breathe deeper creating better throttle response as well as a greater range of torque and horsepower. Benefit from increased horsepower, improved throttle response, and greater torque throughout your engine’s RPM range. …It’s about better fuel mileage. 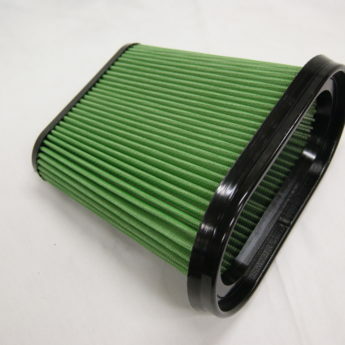 With the increase air flow into your engine from a Green Dragon Filter your engine will be better equipped to control its air/fuel mixture resulting in increased fuel economy. 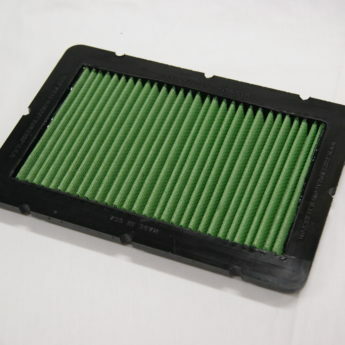 This means that in addition to the performance enhancements a Green Dragon High Performance Air Filter can provide. You also reap the benefit of increased fuel mileage. Depending on your manufacturers recommended service interval you could change your filter almost 10 times in 100,000 miles. If a replacement filter cost $40.00 on average. You could end up spending $400.00 in filters alone. Not to mention the environmental factor of 10 filters going to the landfill. 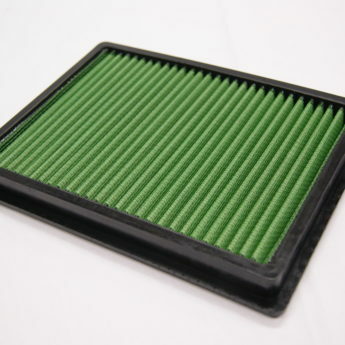 When you replace your stock filter with a Green Dragon Performance Filter it will be the last one you will need to purchase. The Green Dragon is designed to be cleaned and reused with our biodegradable cleaner and synthetic oil. The result is a savings in your wallet as well as the environment.